The Tatra Mountains offer very extensive possibilities for ski touring. As mentioned above the entire area of three ranges of Belianske, High and Western Tatras makes up 780 sq. km. Every winter ski touring enthusiasts cut several hundred miles of trails in this picturesque land. Belianske Tatras and Western Tatras could be included in a longer trip agenda, where the more impressive High Tatras would be the core of the visit. The Tatranska Magistrala is a good main axis for the first time ski tourer, and the tourist paths to Kezmarska, Mala Studena and Mengusovska Valleys could be followed. Ski lifts in Tatranska Lomnica and Strbske Pleso could be the main points for rest stops and cultural breaks. If the snow conditions permit, various cols could be used as valley-to-valley crossings for more demanding and advanced skiers. An important col is situated in Hreben Javorovych Vezi, which commands a great view of the Zadna Javorova Valley and the most interesting upper part of Bielovodska Valley. Koprova Valley, on the verge of the High Tatras and Western Tatras, with its famous Krivan peak (the Matterhorn of Tatras) is renowned for its remoteness and beauty. Popradske Pleso hut also known as Kpt. Moravku is a superbly located place with good access to this unique ski touring region. For more detailed ski touring itineraries visit our Tatras Ski Touring section. Very heavy snow dumps are common in the Tatras. Solid weather and research of snow conditions is always advisable for planning safe itineraries. Check here for the valley-by-valley snow conditions and avalanche risk level. You may also want to make a note of where to look for the Tatras' icefalls which form some of most beautiful natural shapes. You will find the locations of all mentioned here attractions on the High Tatras map. 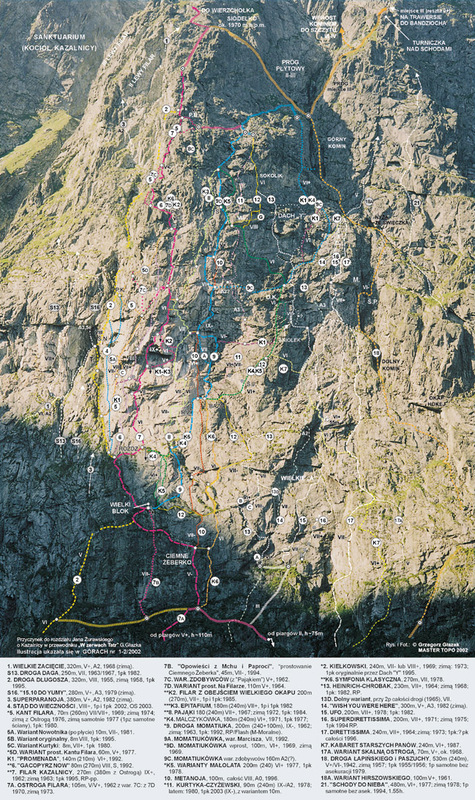 All the valleys are described here in order from east to west with the direction of a proposed ski touring itinerary. Such itinerary would start in Belianske Tatras, in a Slovak village called Tatranska Kotlina, which is located 5 miles N of Tatranska Lomnica. You would cross Belianske Tatras to carry on S-W direction through mentioned below Slovak valleys, then turn north to Polish Morskie Oko Valley to finish at Lysa Polana on Polish-Slovak border. A bus from Lysa Polana to Zakopane would be taken to carry on to Krakow. Alternatively one more day could be spend traversing other Polish valleys. Kezmarska Valley is for many the queen of the Tatras. Its main body is of varied shape and it splits into three smaller valleys at its upper section. The main climbing target could be the north face of Maly Kezmarsky, which is the biggest face in Tatras (900m high). Only the S-E ridge of Slavkovsky and N-W of Krivan are taller, but their lower parts do not have a high mountain character. This wall is very wide and has complicated form. Huncovky Stit is a smaller neighbour lying east of Maly Kezmarsky, and its N face is almost equally impressive. Pysny Stit, with a moderately long approach from the hut, offers good winter climbing. The south side of the Zmrzla Veza ridge presents many superb quality summer routes. Of the other interesting peaks Jastrabja Veza stands out with its high-grade rock and aid climbing on the S-E wall. In summary, for winter a minimum 3 outstanding days could be spent with one classic on the N of Huncovsky, another one on N of Maly Kezmarsky and an early day start on the ice fall leading to Mala Zmrzla Dolina, followed by a quick route up Kolovy Stit and down its east ridge to descend on Jastrabia Veza. No other valley has such an alpine feel. The very friendly atmosphere in the hut and the view over the Belianske Tatras are additional motivating factors to stay here for longer. The price for a bed is around 6 euros in winter and 10 in summer. Morskie Oko, Mengusovska, Batizovska and Mala Studena valleys seem to be of equal climbing value. They all offer good climbing choices both in winter and summer, and are very picturesque at the same. Mala Studena Valley is probably the safest one in periods of high avalanche warning, which occur quite frequently. With its cols over to Kezmarska, Velka Studena and Javorowa valleys it's a central point for winter ski touring trips. The hut master of Teryho hut is not a very kind person, but for money and western clients he will do anything. The southwest wall of Lomnicky Stit and N face of Prostredny Hrot are the jewels of the valley, but there are many more attractions, especially for summer time. Bartizowska Valley is the main reason for continuing your ski touring trip from the Velicka to Mengusovska Valleys. Alternatively, you can avoid this less interesting part of the main hiking track by crossing Kacacia and Ceska valleys to Mengusovska Valley. Batizovska has no hut in close proximity and could be a good place for camping. With the most complicated and most massive structure, Gerlach is the main focus of the valley. Koncista and Batizovsky also have substantially big walls. The highly aesthetic ridgeline, which constitutes the rim of this circular valley, provides a good overview of the High Tatras. Mengusovska Valley is situated in a direct line between Rysy (col to Poland and the Morskie Oko Valley) and Strbske Pleso (ski village). With its easy car access and superb quality hut it's the best target for shorter visits. Its picturesque surroundings, lots of forests, two big lakes and good infrastructure will tempt you for a romantic trip with your girlfriend. Its proximity to the western part of the High Tatras with Krivan "the peak of artists" and two other small valleys is an extra incentive for coming to the Pri Popradskom Plese hut. Morskie Oko Valley (Moko) is for many the most beautiful valley on the Polish side. It is in many ways very similar to Kezmarska Valley in Slovakia. You can find here the wall of the superbly exposed Kazalnica aka Zerwa (670m). Mnich, Cubryna and Mieguszowiecki offer numerous classic climbs both in winter and summer. Two sections of the surrounding ridge call for special attention, namely Zabia Gran with Zabi Kon and Zabi Mnich. The most welcoming aspects of Polish hospitality await the most refined tastes in this jewel of a hut.